Below: Another anomaly in the world of third pattern knives. The smooth handle is turned from aluminum and the standard size/shape guard is also aluminum. It is not a "Polish" Commando knife. It may be a post-war model. The blade is very heavy in cross-section and finely made. The guard is stamped on the bottom "TRIAL." The standard looking sheath is of very high quality and has an unusual attachment of the elastic. Below: This knife breaks all the norms. Most obviously it is a smooth handled version with no mold marks. It has a standard guard which is also unmarked. The blade is ground completely different which makes me doubt whether it was forged from the same dies as other third pattern blades. A 100% perfect french blue finish covers the blade. The quality of the knife and Camp-X style sheath is excellent! The handle seems to have a heavy black enamel like coating over possibly an aluminum base. The brass top nut is low profile and the tang is peened. Anyone else ever seen one of these? The seller said he has owned four of them over the years past. Below: Another heavy bladed P-3 with the unusual markings of ^ A3. This knife and its sheath are in excellent condition. This is the only P-3 I have with the "A3" inspection stamp. Below: Not my knife. 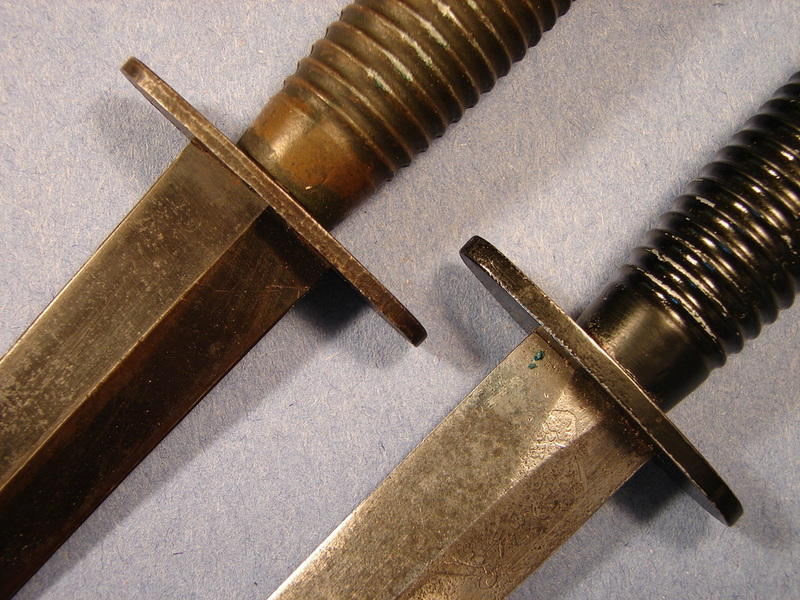 Here we have a heavy bladed WW-II Third Pattern stamped with a broad arrow "V". This is an uncommon stamp which some say is associated with Wilkinson Sword Co. but i don't believe that has been confirmed. The broad-arrow is unusual with one side being much longer than the other. Below: I didn't know where else to place this knife. I know it is a modified WW-II Third Pattern. Some might call it a "fake" Polish F-S. I prefer to call it just a modified F-S. I believe that whomever modified the handle did so to make it more comfortable to his hand and not as an attempt to deceive. The knife was taken apart to make the changes and the handle is now slightly loose. It was not stamped "England" so it was a bring back from the war. A high quality sheath came with it that I believe was for a second pattern since it had remnants of the thin brown elastic. One odd thing is the chape was painted a forest green a long time ago. There is a man's name (or Unit) and service number cut in tiny font near the throat of the sheath. I cannot read the name clearly yet. UPDATE: A good friend has confirmed the service number is indeed British and dates to sometime prior to 1949 latest. Third Pattern knives can be readily divided into two basic categories, those having either thick or thin blades. There is some speculation that all of the thick ones were trickle down from the remaining stock of Second Pattern production. I doubt this theory is totally correct but it is a possibility because there are also some P-2 knives with thicker or thinner blades. While I am on this topic I will discuss the urban legend about the triangular flats where the blades enter the guards further down the page. Also I will explain the difference in fit between P-1 and P-2 or P-3 guards. 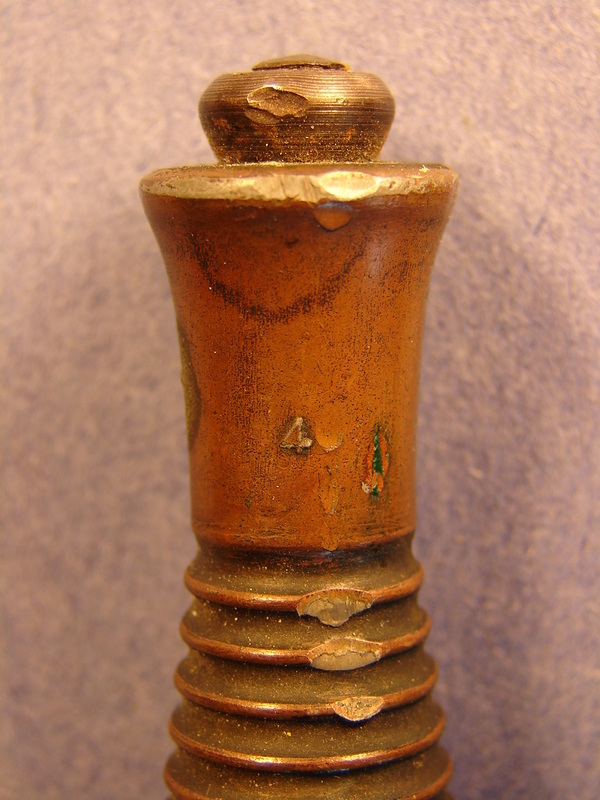 Note also the copper flashing on the alloy handles is often misrepresented by sellers as being a brass handle. IT IS NOT! 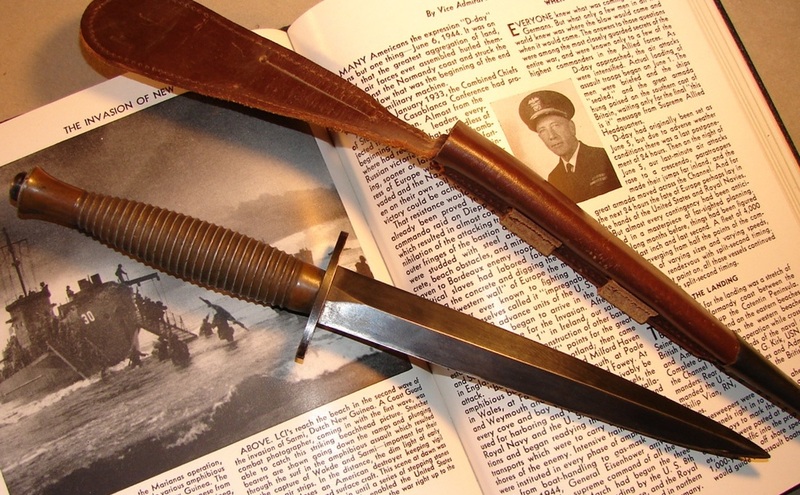 Introduced in October of 1943 many F-S aficionados do not consider the Third Pattern Commando knife a "Fairbairn Sykes". By this time the design had mutated to something quite different, sharing only the format of a seven inch double-edged blade. The knife in this photo is an early one fitted with a heavy forged blade of the Second Pattern style. For collectors, Third Pattern knives with heavy blades are always more desirable. The most desirable of all are, of course, those with Wilkinson Sword Co. etchings. The Third Pattern is easily recognized by its ringed alloy grip. Rightly or wrongly, this design is attributed to the William Rodgers firm. The handles were originally thought to be cast in a gang mold in quantities of four at a time. (It has now been determined that there were four separate casting molds and more than one casting firm.) Each mold cavity left its own raised number on the casting. This number appears near the top of the pommel. Quite often later post-war knives do not have this mold number. The quality of the castings is generally very good. The handles had the mold parting marks removed and they were then copper plated. Most of the handles were finished black although some were nickel plated. Some people prefer the ergonomics of the Third Pattern grip. Others say that it ruined the balance of the knife. Truth is, it was the introduction of the thin blades that really ruined the balance, not the change to the grip. As the heavier blades were used up and steel became scarcer, the blades were forged thinner and more coarsely finished. Many of the knives have rough grinding marks visible through the black finish applied to the blades. 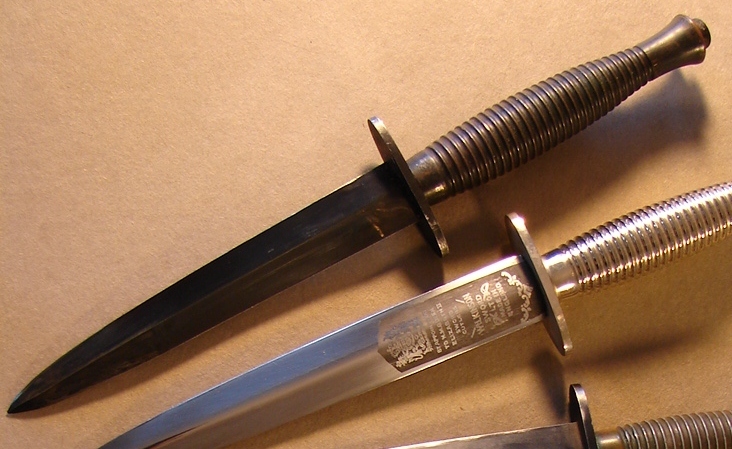 The later production cross guards were also stamped of thinner stock and their fit to the tang was often quite sloppy. These poor quality knives were clearly not produced by Wilkinson Sword Co, but by other firms who had gained war-time contracts. 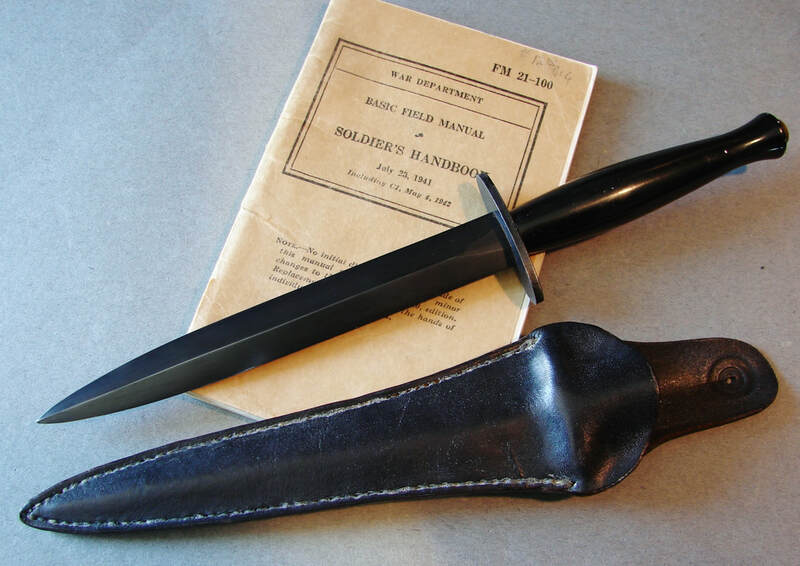 One production figure that I found for WW-II Third Pattern knives was over three hundred fifty thousand. If that number is true then I suppose it might help explain the loss of quality. Wilkinson Sword Co. continued to turn out high quality F~S knives like the one shown below. Up until the closing of the factory you could order a knife in either black chrome or nicklel finish. 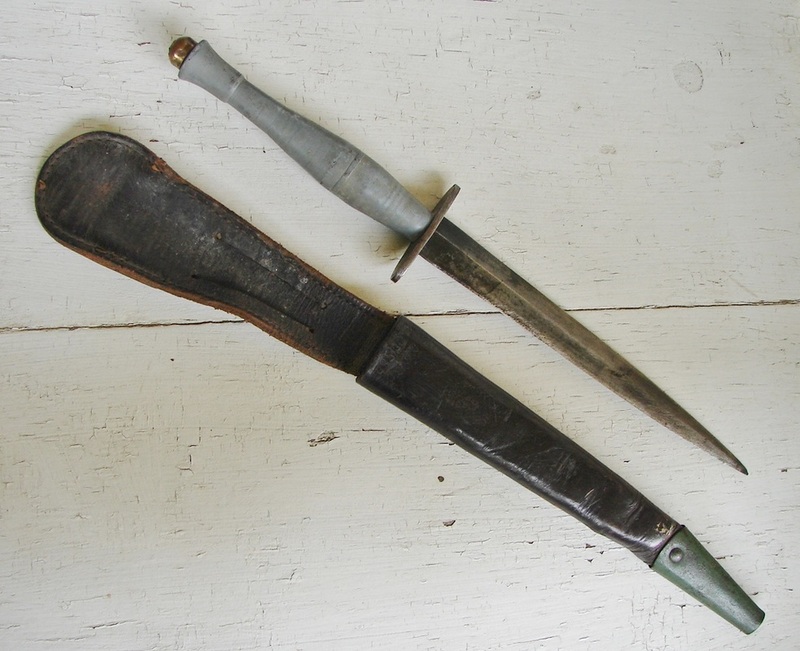 Illustrated below is a thick bladed war-time third pattern knife. While many were critical of third pattern knives, those with the heavy blades were, and still are, excellent fighting knives. The top knife (following photo) is clear proof that even a thick bladed knife is not indestructible. 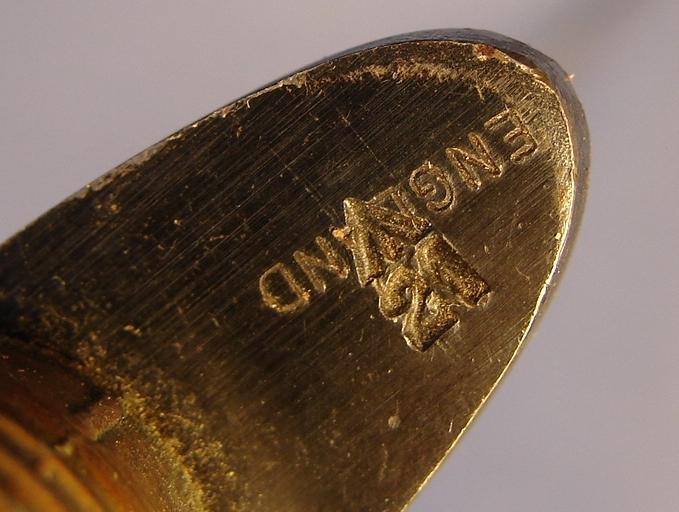 It has been broken and shortened considerably.This is one of the rare knives that is stamped around the pommel FR693. Beware, there are many fakes with this marking coming out of India it would appear. They can be picked out by their broad blades, with poorly defined median ridge and clumsy, thick leather sheaths. I have included one of these in the post-war section. The knife shown below is the FR693 knife with the broken blade. 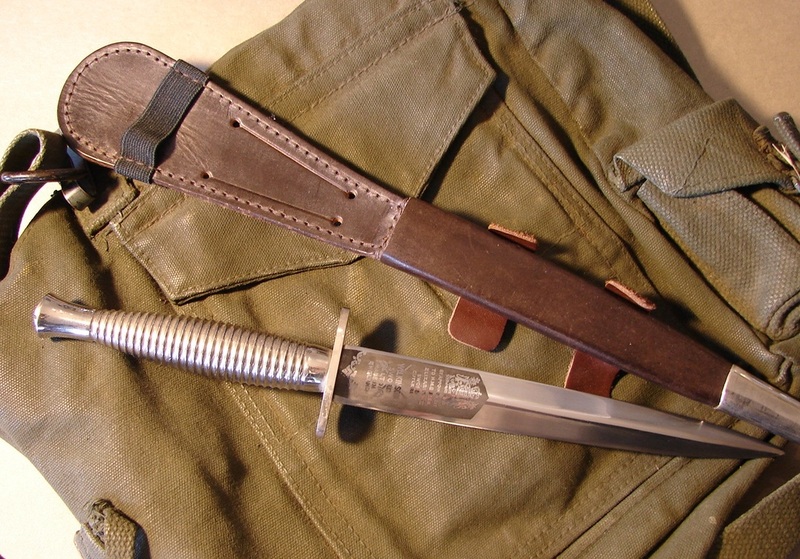 It is presently sheathed in a US GI Bayonet scabbard. One source says they are Wilkinson, another says BSA manufacture. Either way it is a top quality knife. It is the knife positioned far left in the array below. Below: Top blade is the thick version and the bottom one is the later thin version. They are both forged blades. The top one was hand ground and the lower one is machine ground. One urban legend says that the flats were created during the“drawing” process involved in forming the blades. This is simply wrong. The blades were forged, not drawn. Wire and tubing are “drawn” but not knife blades. Another legend says that the flats came from the “clamping fixture.” What clamping fixture? 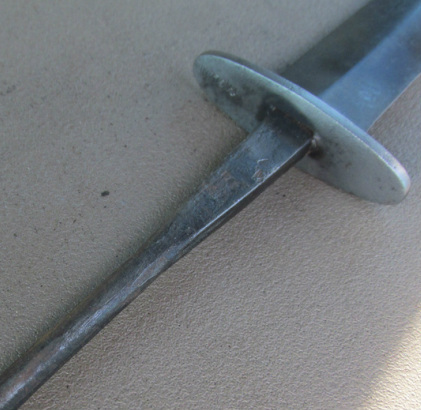 The guards were stamped from sheet steel, including the square hole for the tang. If you have never had an F~S apart you would not know that the tang near the guard is flat, with a rectangular cross-section. Eventually it transitions to roughly-round, and finally to full round where it is threaded for the top nut. The mysterious flats on the blade are simply the way its thickness was reduced by grinding to permit the blade to enter the fixed size hole stamped in the guard. 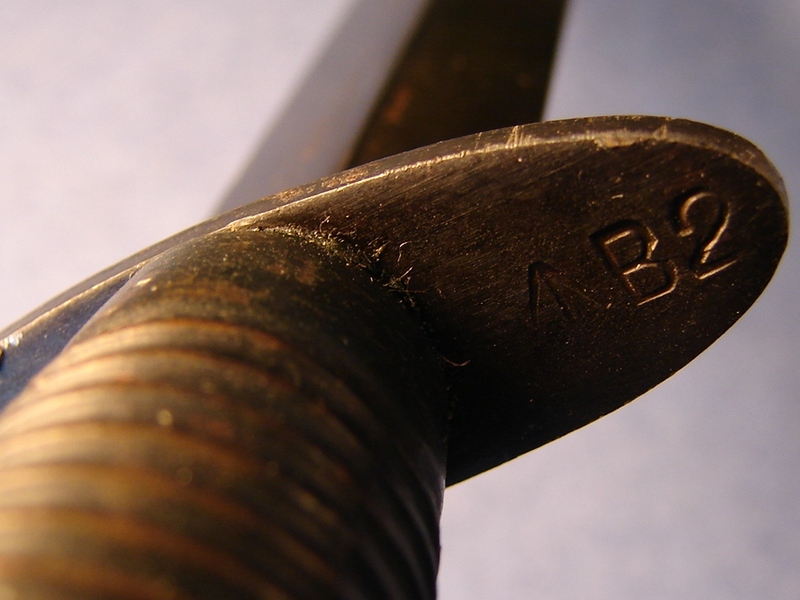 With the original P-1 design, the square shank (ricasso) on the First Patterns over-lapped and hid the square hole in the guard. I also believe that more time was taken in fitting the guards on the P-1s. As time became scarcer, and manufacturers needed to add less skilled workers, some of the precise fitting slipped by the wayside. When the tablet ricasso was done away with, the corners of the hole it normally covered were left exposed. Unfortunately these gaps allowed dirt, blood and other fluids to enter and perhaps cause corrosion in an already weak area. Of course the thinner the blade, the bigger the gaps, plain and simple. There are several different inspectors’ stamps that show up consistently on thick bladed knives and not on thin ones and vice-versa. This conformity in stamps makes me think that certain inspectors were responsible for knives created in one geographic region, or that they were assigned to certain manufacturers. All of the thick bladed P-3 (and P-2 as well) that I have seen had the broad arrow and one of these three stamps: “I”, “42”, or “B2.” Shown below is a less common stamping, the broad-arrow with No. 21 stamp. Obviously, given a choice, a thick blade is generally preferable to a thin one for reasons of strength. As noted elsewhere many of the thinner blades were known to be fragile and of poorer quality. This was especially true of post-war knives and those made in third world countries. At one time it was thought that only the thick blades were forged and the thin ones were ground from flat stock but other experts have stated that they were all forged. Of course proper heat treat may have been an issue with blade breakage as well because a thin blade, of the correct steel, properly heat-treated, can be quite tough. A good example of this are the excellent “Castle Knives” commissioned and sold by William Cassidy. Over the years I have picked up a number of P-3 that were made from wartime parts, but which are nickle plated. I am not sure if they were plated when they were built, plated later, as over-runs of war production, or long after the war. They have mostly come out of Canada and are all thin bladed versions. 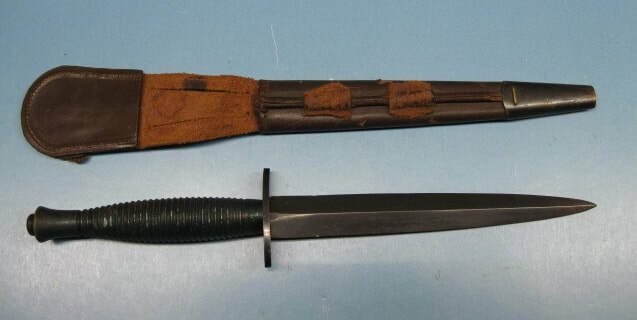 They have generally been sheathed in WW-II style sheaths with the thinner elastic retaining strap. 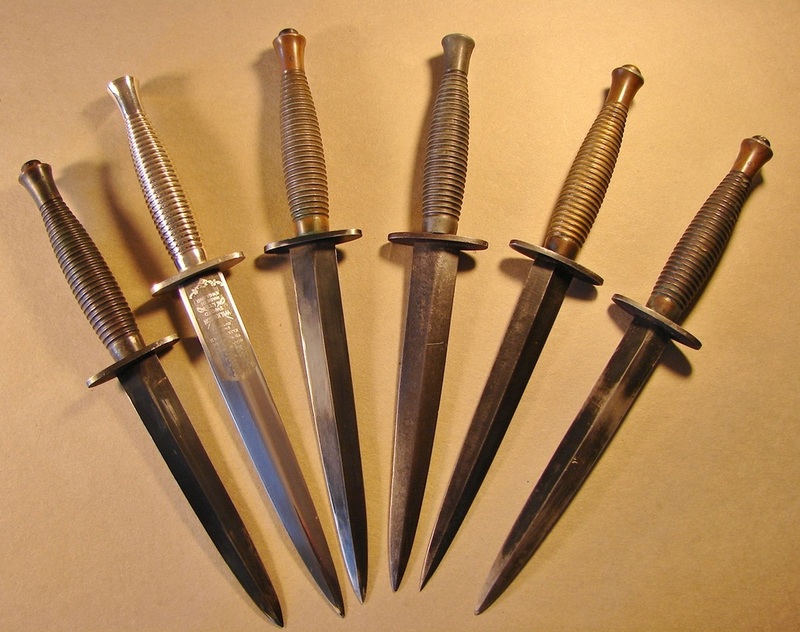 The knife third from the right is a Wilkinson Sword and the blade is etched with their logo, which is barely visible. 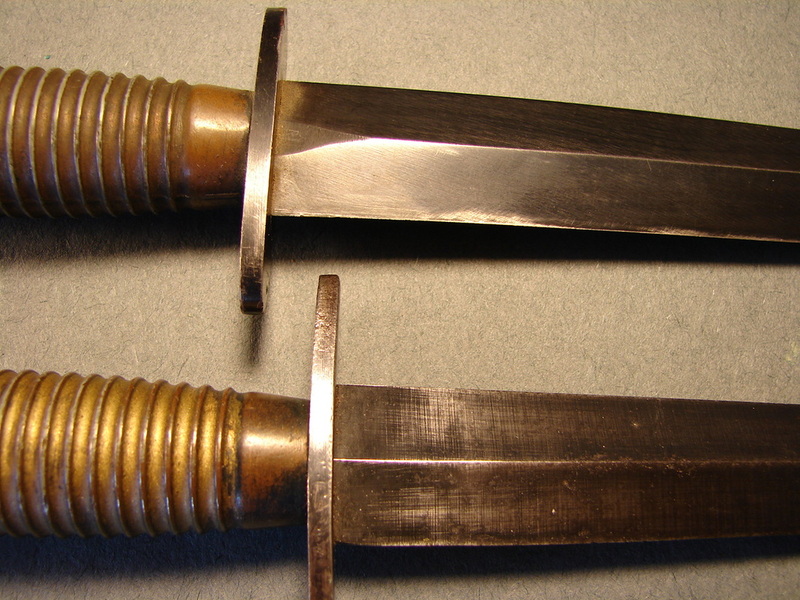 In addition to thick and thin blades, 3rd pattern F-S can also be somewhat dated by the guards. Early ones are thicker and their edges are finely finished. Over time they were stamped from thinner stock and the edges left showing the coarse marks from the shearing process. 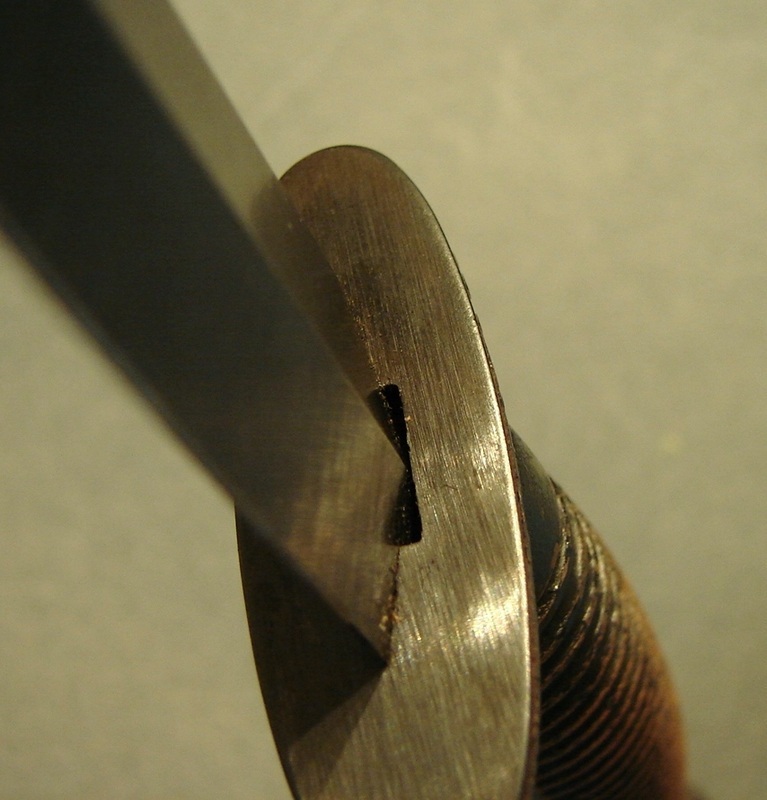 The late post war guards are often extremely thin and have large gaps between blade tang and the opening in the guard. The two knives to the right clearly illustrate the difference. 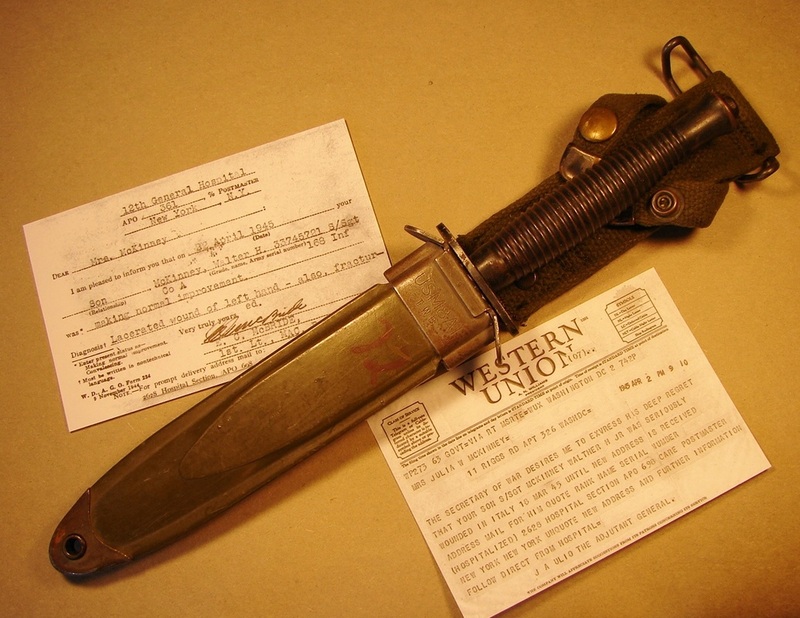 The top knife is late war or post war. The lower one is a Wilkinson Sword Co. which I believe is war-time production. Note the "triangle" in the blade of the bottom one indicating it is a thick blade. Also note the smoothly finished edge on the thicker Wilkinson guard.